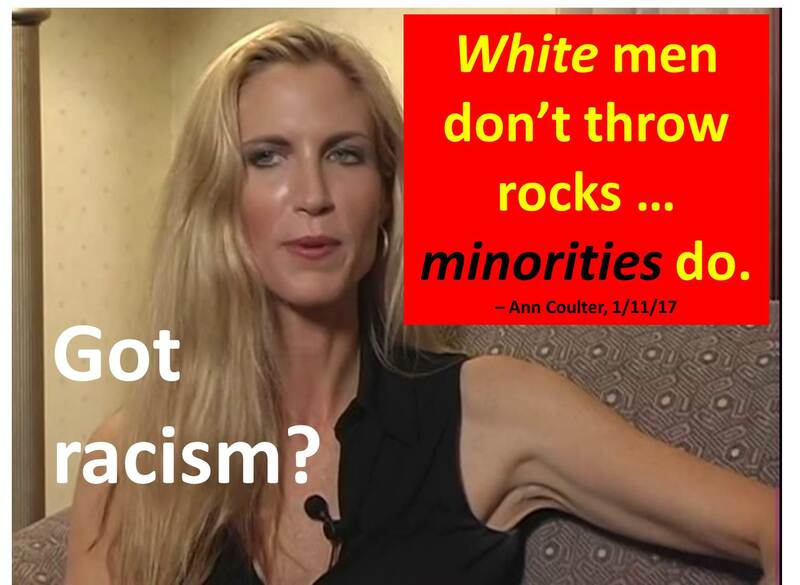 Renowned for her racism, Ann Coulter again heralded the racial superiority of the white male over minorities (particularly women). 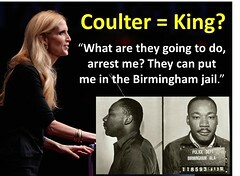 During the last presidential cycle, Coulter claimed that she deserved a racism credit because of her good intentions. Her deepest desire is to recreate a WASP America, arguing that true diversity is white. Oh, and the superiority of WASP culture can be traced to its genes. Coulter has become the high priestess of the Alt-Right movement, yet denies that its worldview and agenda emulate those of David Duke. She even confused the Confederate and American flags. Coulter’s racist views keep bubbling out in her tweets, columns, and books because she regards herself as genetically superior to other people. 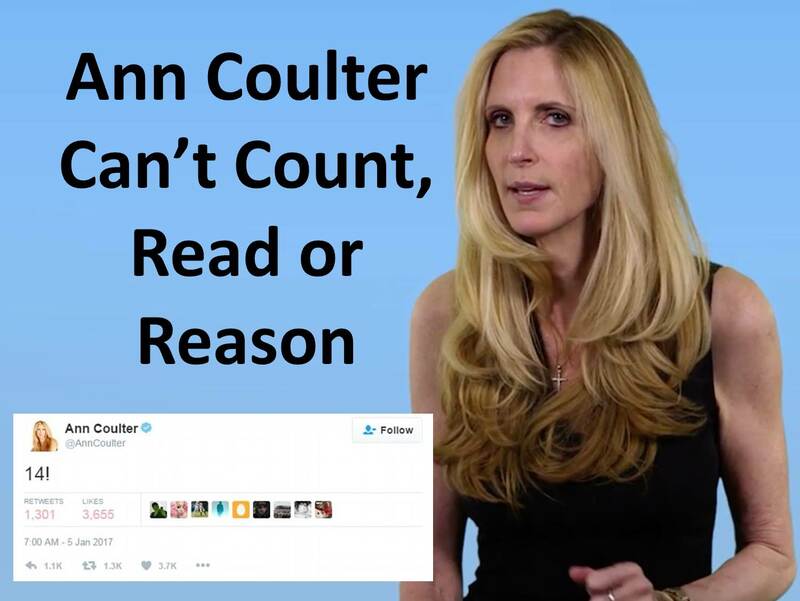 In a stunning twitterstorm, Ann Coulter proved that she cannot count, read, or reason. Coulter was outed on January 5th, with a big controversy over her three-character tweet – “14!” – which shed obviously meant to identify the number of days until Trump’s inauguration but which was misconstrued as a white supremacist code word. 6:20 pm – Unknown to me, but VERY well known to hysterics, “14” has some mystical significance for the 5 or 6 ppl who believe themselves to be Nazis. 6:21 pm – Being the target of idiotic attacks can be fun! But being called a Nazi – even by ppl who are really really really dumb – isn’t so fun. 6:21 pm – The ringleader, a CUNY prof who specializes in – you’ll never guess! – social activism on the taxpayer’s dime, can’t figure out Twitter. 6:22 pm – This loathsome creature takes taxpayer money in order to waste students’ time and ensure that they are unemployable. Coulter seemed particularly incensed over being called a Nazi, an appellation which actually deserves some consideration. 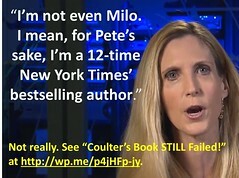 As for counting, well, Coulter needs some lessons. 20 days – 5 days = 15 (not 14) days! Indeed, her rebuttals merely proved the point of her critics. Coulter’s error could easily be corrected by 1) counting on one’s fingers, 2) accurately reading source material, and 3) reason. Both literacy and numeracy appear to evade Coulter. She even thinks the Great Depression was a time of unparalleled prosperity for America. Now that’s bad counting. In other words, Coulter was using the clock counting down to midnight, not noon (when the inauguration actually takes place). Each countdown is X days plus hours, minutes, and seconds. 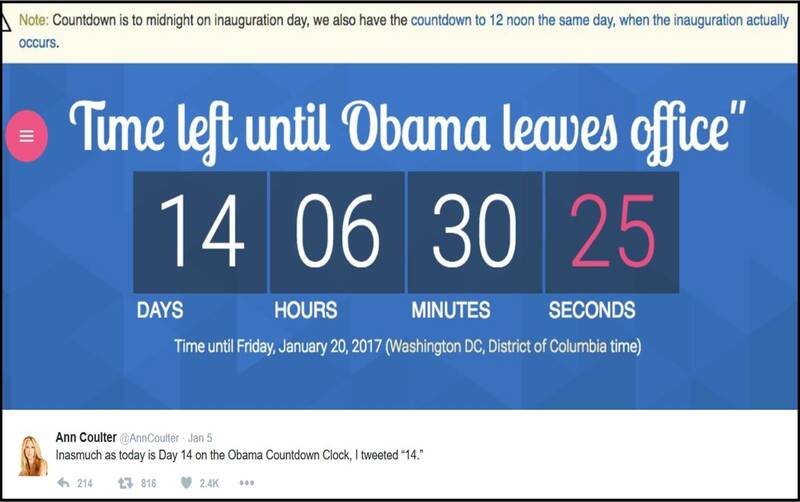 Coulter should have used the noon countdown clock to determine the time until Trump’s inauguration (as plainly stated on the clock). 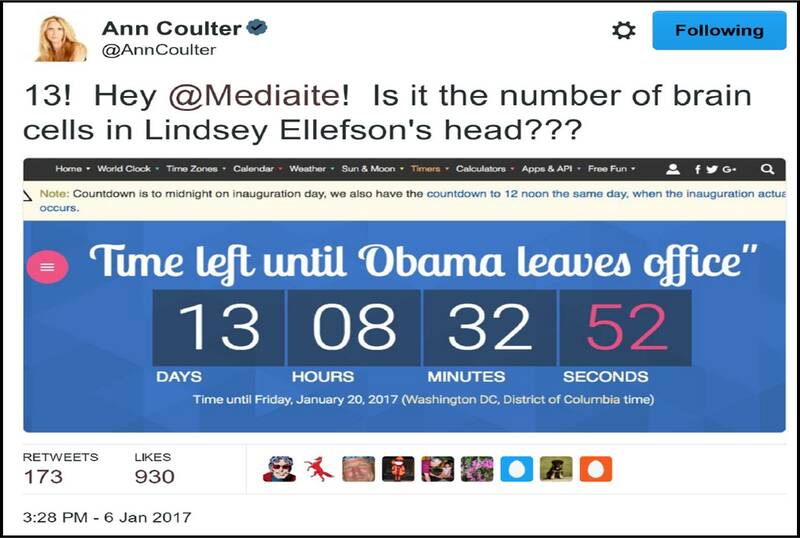 By her own account, for a year Coulter has been counting down to the day of the inauguration, not to the inauguration (and failing to see the difference). Humor notwithstanding, Coulter replicated her mistake from the previous day. Berating her critics for their paucity of brain cells, Coulter showed herself immune from reason. Let’s read the countdown clock she used. It gives the days, hours, minutes, and seconds. In other words, more than 13 days (i.e., 13 days plus part of a 14th day). It’s not in 13 days, it’s on the 14th day. So, Coulter’s critics – and everyone else who knows how to count on their fingers – knows it’s 14 days until Trump becomes president. Coulter’s critics were rash – but understandably so – to impart a nefarious meaning to Coulter’s “14!” tweet. For her part, Coulter has again demonstrated that she doesn’t handle criticism very well, is quick to justify herself, and loathe to admit error. 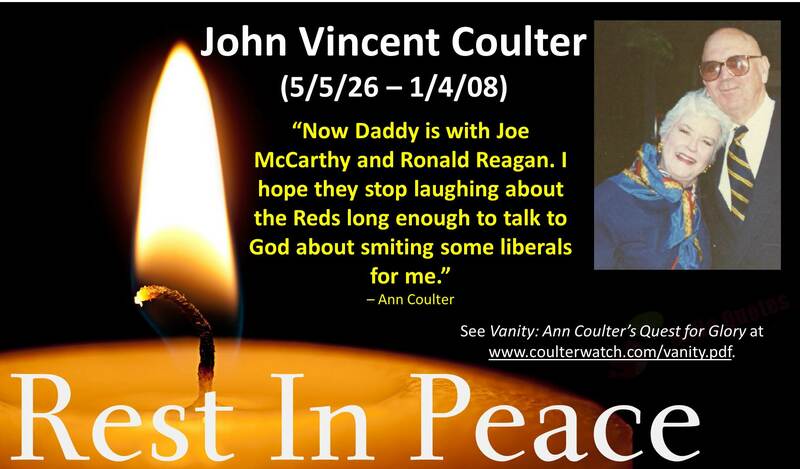 Ann Coulter’s world fell apart when her parents died: Father in 2008, Mother in 2009. Though their passing was long anticipated, one can never fully prepare for the death of loved ones. Their absence remains a deep void in Ann’s life. Her parents were Ann’s moral compass. From them, she derived her set of personal values, moral standards, political views, and religious beliefs. Since their passing, Ann has haphazardly abandoned those values, standards, views, and beliefs. In 2008, the family patriarch – John V. Coulter – passed away. With his passing, Ann lost a sense of safety, security, and stability. Daddy passed away after years of declining health from dementia, a tragic and traumatic time for the whole family. In her eulogy, Ann provided poignant personal anecdotes but also exploited her father’s memory to attack liberals and defend herself. What I can’t do, I pray God will. Ann’s words – and the blogger’s interpretation of those words – suggest that Ann is unfamiliar with basic Christianity: our Father in heaven is a God of love who gave His only Son to save and redeem the lost and the broken (John 3:16). May God grant healing in the deepest recesses of Ann’s heart. May He bring Ann’s internal compass into alignment with the North Star of Jesus Christ. And may His grace and peace be upon her.